Sampling and analyzing soil in order to make specific recommendations for each tree or shrub on a property. Healthy plants begin with healthy soils. Fertilization is just the start. Adjusting soil pH and ensuring adequate organic matter is present are also key to healthy soils. For plants in urban and suburban soils, Bartlett Tree Experts can simulate the optimal conditions for growth found in nature. In fact, our patented Root Invigoration process combines all the above into a single treatment to achieve this goal. Bartlett offers the most intensive soil care programs in the landscape industry. Before fertilization is performed, soil samples are taken from the property and analyzed. Bartlett Arborists submit more than 10,000 soil samples from client properties each year, which provides information for developing fertilizers for specific geographic areas. We offer more than 15 different blends of our own Boost® fertilizers all of which contain slow-release nitrogen that provides this nutrient gradually over the entire growing season. This means that nitrogen is not lost to leaching and runoff, which optimizes availability, while protecting the environment. If soil phosphorus levels are adequate or treatments are applied in sensitive sites such as watersheds, we use phosphate-free Boost products that are specifically formulated to eliminate water pollution from this nutrient. Bartlett also offers a unique Prescription Fertilization program whereby nutrients and amendments can be custom-blended on site and applied to specific plants based on soil analysis results. This program is ideal for high value, feature plants and those with obvious nutrient deficiencies or health concerns. Improving aeration, incorporating nutrients, and reducing soil compaction with air spade. Our patented Root Invigoration program, developed by scientists at the Bartlett Tree Research Laboratories to improve soil conditions, incorporates several key plant health treatments. By using high-volume air through a patented tool, it loosens the soil to improve aeration and reduce compaction, without any negative impact on the root system. During this process, the soil chemistry is adjusted by prescription to best favor the plant. Organic matter is incorporated, as it is commonly deficient in urban soils, and because of the many physical and chemical benefits it provides. A Bartlett Arborist Representative can determine whether trees on your property would benefit from this service. Looking at problems posed by excess soil and mulch around the base of tree. Bartlett Tree Experts provides a variety of treatments to both encourage root development, as well as prevent root encroachment beneath sidewalks and driveways. Homeowners frequently ask about treatments to eliminate surface roots of trees especially in lawn areas. Certain species, such as red maple, birch, and elm are inherently shallow rooted and more prone to producing surface roots. Surface roots are more common in heavy clay soils compared to sands or loams. Frequent light irrigation also can increase the likelihood that trees develop surface roots. Once surface roots become a problem, there is little that can be done to correct the condition. Cutting the roots can impact tree health and stability and roots are likely to grow back if the plant survives. Most trees species will tolerate covering the offending roots with a few inches of loam soil but as the roots grow in diameter, they will reappear on the surface. If soil is added, make sure it is not placed on the root collar and against the stem. The best option for dealing with surface roots is to mulch the area beneath the tree crown to avoid conflict between tree roots and turf. Root Invigoration, a patented process developed by scientists at the Bartlett Tree Research Laboratories, uses a unique tool known as an Air-Spade that concentrates a high volume of air on a small area of soil. This acts to loosen dense soil and allows incorporation of composts and other necessary amendments in order to promote root development on trees stressed by soil compaction, root damage, and root disease. Air-tools are also used to rapidly remove soil and mulch that have been placed against root collar and stem tissues during planting, construction, and maintenance. The root collar, which is the area where the root system joins the stem, should remain free of soil and mulch to reduce the risk of disease and insect infestations and stem girdling roots. There are several types of root barriers that are now available to restrict development of tree root systems beneath pavement to prevent heaving. Barriers are comprised of high-density plastic or fabric that is impregnated with a chemical that prevents root growth. Bartlett's Premium Landscape Biochar benefits your trees and the environment. This carbon-rich charcoal improves soil quality and plant growth for healthier trees while sequestering carbon that would otherwise contribute to elevated levels of greenhouse gases. Biochar is created when plant-based and other organic debris like wood, manure or leaves are heated in the presence of little or no oxygen. This process has been used for centuries and is credited with high crop productivity in ancient soils like the Amazon Basin where charred matter was historically used as a soil additive. Today the application of Biochar, made from what would otherwise be agricultural and horticultural waste products, has the potential to sequester carbon for years to come. 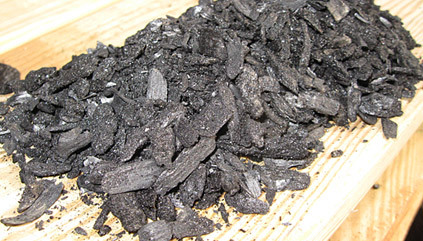 The Bartlett Tree Research Laboratories has conducted extensive research on the use of Biochar in the care of trees. We have undertaken no less than eight research projects to determine the benefits and real-world applications of this product on residential and commercial properties. We have found that when added to soil, Biochar increases soil microbial activity and improves water retention, all while reducing nutrient leaching. The result is healthier trees and shrubs that are less susceptible to insects and disease. Bartlett offers a complete line of organic fertilizers and amendments for soil care. Compost and organic granular fertilizers as well as mycorrhizal inoculants can be introduced into soils using our patented Root Invigoration process. This is the most effective treatment for amending soils and keeping the soil food web in balance as nature intended. New since 2008, is Boost Natural. This is the only totally organic liquid fertilizer that meets industry standards for supplying nutrients to trees with a single application. Boost Natural is certified organic by OMRI (Organic Materials Review Institute). When performed correctly, mulching is one of the most effective practices to maintain plant health. Organic mulches composed of wood chips, bark, and leaves including pine needles and compost are all suitable mulches for woody and herbaceous landscape plants. Ideally, mulch should be applied beneath the entire canopy, but smaller mulched areas are suitable. Depth does not have to exceed four inches and two inches of mulch is adequate on shallow rooted shrubs and perennials. Mulch beds do not have to be round or symmetrical. Irregular designs may be more aesthetically pleasing. Shrubs and perennials can be planted within the mulch areas but solid masses of ground covers should be avoided where optimum tree growth is desired. The biggest mistake people make when mulching is piling it against stems of trees and shrubs. 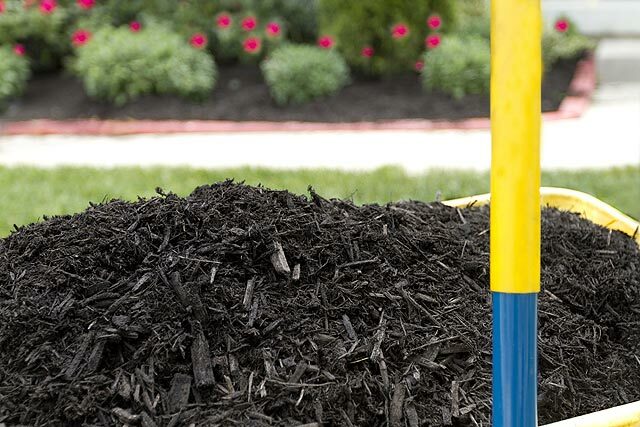 Mulch “mountains” and “mulch volcanoes” are so common in some regions that homeowners and some professionals think this is acceptable and even desirable. Stem tissues are not intended to remain constantly moist from mulch accumulation. Insect and disease infestations, as well as stem girdling roots, often develop on trees with excessive mulching.